During peak season (June 27-August 29) only Saturday to Saturday stays are permitted. During low season (May 1-June 26, August 30-October 15), a 2-night minimum stay is required. All rentals are refundable with a 21-day advance written notice of cancellation prior to the arrival date, less a $25 cancellation charge. Notice of cancellation of less than required days will result in forfeiture of the required deposit. 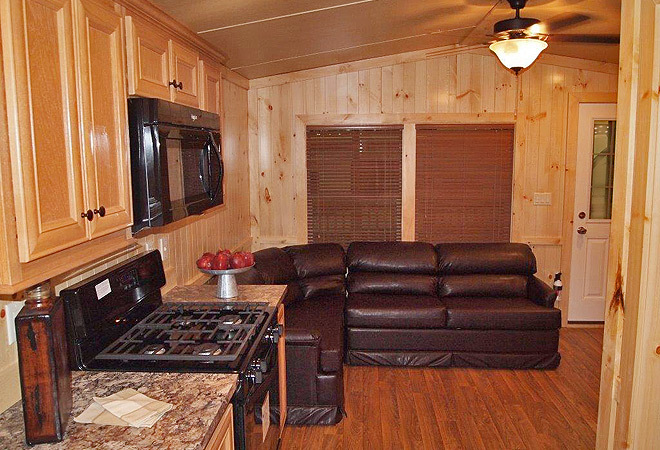 These 14'x37' deluxe cabins come with a covered screened in porch. Each cabin includes 2 bedrooms; one queen bed and the other with a full-size bunk bed. The large kitchen has a full-size refrigerator, stove with oven, microwave, coffee maker, toaster, and dinnerware for 6. In addition to a pull-out sofa, the living/dining room includes a table that seats 4. Full restroom facilities include a combo shower/tub. All rentals come with heat, A/C and large flat screen TV. Enjoy the comfort of our new cabins in the great outdoors! We do not allow pets in this accommodation type; however, we do allow service animals and a service animal may have stayed in these rentals. These lakefront cabins sleep 6 people and include one queen bed, full size sofa bed, and 38' x 12' loft area with screened-in porch. Bed linens, pillows and towels not provided. No smoking. We do not allow pets in this accommodation type; however, we do allow service animals and a service animal may have stayed in this rental.